A rare soul who always lived for others and at the same time remained totally absorbed in God. 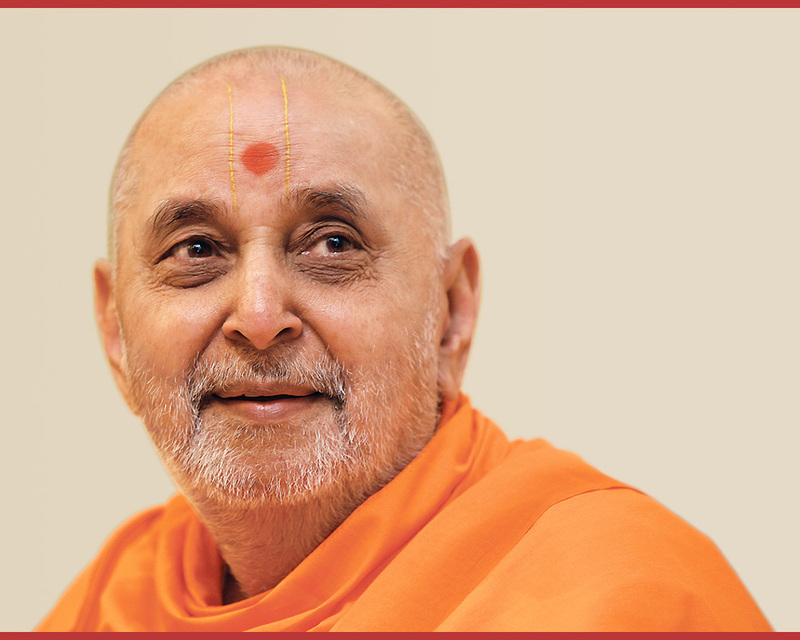 A peaceful, humble, simple and spiritual personality – this is Pramukh Swami Maharaj. This great guru, the fifth spiritual successor in Bhagwan Swaminarayan’s succession of Gunatit gurus, was born in a farmer’s family on 7 December 1921, in the village of Chansad, located near Vadodara. His childhood name was Shantilal. And true to his name, peace was the introduction to his personality. From his childhood, his inclination was to perform spiritual austerities in the Himalayas. 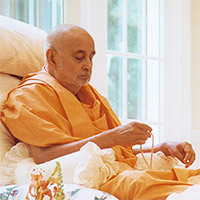 However, during his adolescent years, he was attracted to the pure life of Brahmaswarup Shastriji Maharaj, Bhagwan Swaminarayan’s third spiritual successor. After completing his initial studies at the age of 18, he renounced the world and was initiated by Shastriji Maharaj in 1940, and renamed Narayanswarupdas Swami. His striking humility, noble services, saintliness and selfless desire to help all, won him the love of everyone. In 1950, when he was only 28 years old, Shastriji Maharaj appointed him as the president of BAPS. 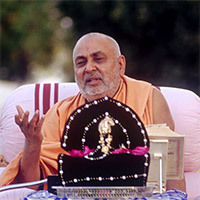 From then on, he affectionately became known as ‘Pramukh Swami’. Shastriji Maharaj passed away in 1951, declaring Yogiji Maharaj as his spiritual successor. Thereafter, Pramukh Swami served under the guidance and blessings of Yogiji Maharaj. 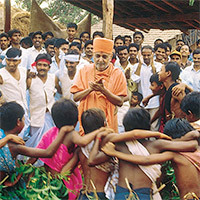 In 1971, he became the spiritual successor of Brahmaswarup Yogiji Maharaj and his life has continued to be an inspiration to countless people, guiding them all to lead a spiritual life. “In the joy of others lies our own…” This maxim by Pramukh Swami Maharaj is not only an inspiring call for all of humanity, but also reflects the spirit of his humanitarian services to humankind and society. Out of his compassion for humanity, he has tirelessly visited over 17,000 villages, towns and cities. In addition to the renowned Swaminarayan Akshardham complexes in New Delhi and Gandhinagar, he has gifted the world with over 1,100 mandirs. These mandirs and cultural complexes have become hallmarks in preserving culture and performing social services. Remaining aloof from caste or creed, his borderless love has touched the lives of many, whether young or old, literate or illiterate, and rich or poor. 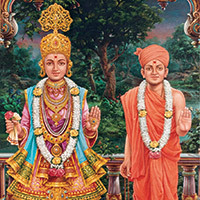 As the spiritual leader of a worldwide socio-spiritual organization, BAPS Swaminarayan Sanstha, his selfless love and effort have directed the energies of youths to serve as volunteers. 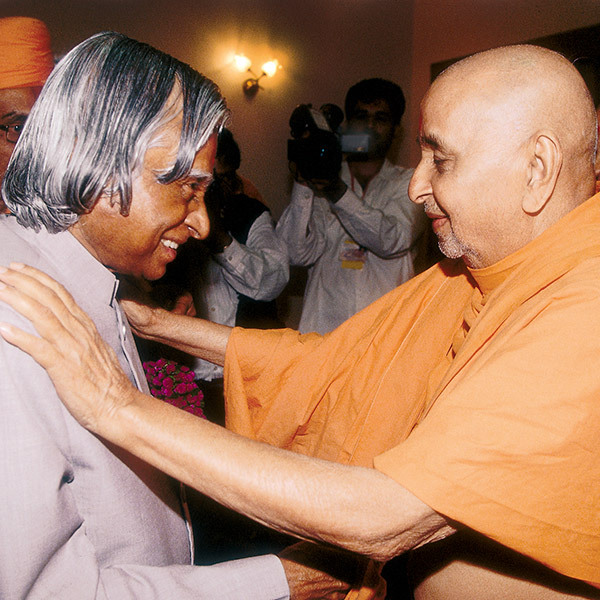 His selfless work has been applauded by revered spiritual luminaries, national leaders and other dignitaries. Innumerable aspirants have experienced peace and the bliss of God in his presence. Many aspirants have reached the highest spiritual state, and today, many others continue to tread this path.